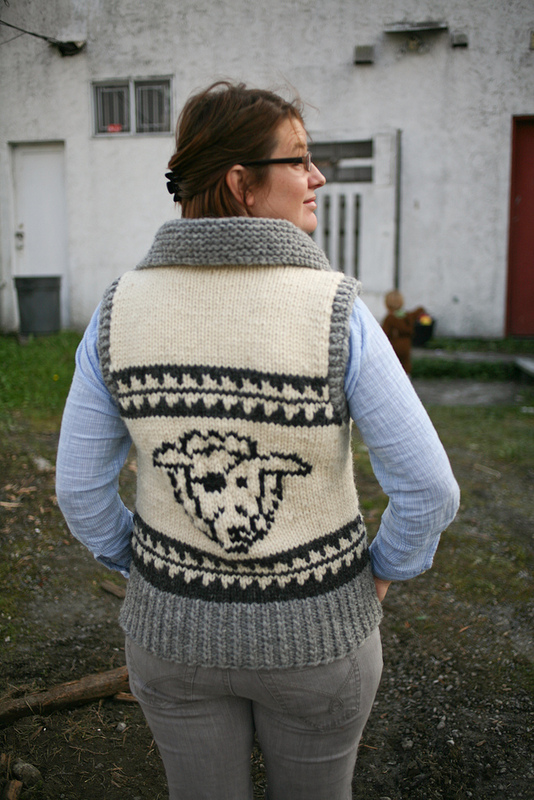 Many of you have seen by now my Cowichan Style Vest that I knit for Knit City 2013. 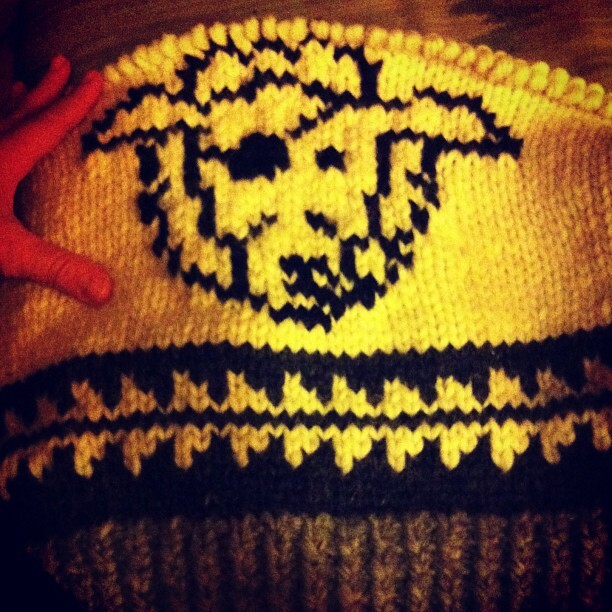 I have not blogged about it yet, mostly because I was hoping to have finished documenting how I made it. 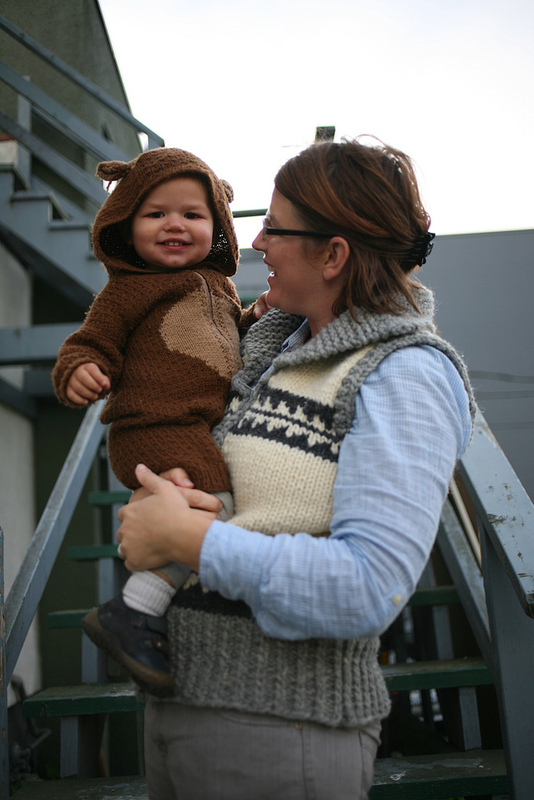 For those of you who know me, you know you may be waiting a while, in the meantime, here is some helpful suggestions if you are hoping to make a Cowichan Style sweater/vest etc. The Baaad Anna’s Logo on the back of my vest! First of all, I refer to my vest as a ‘Cowichan Style’ or ‘Cowichan Inspired’ project. I am not from the Cowichan region, nor am I of Coast Salish decent, so it’s important to respect the history and culture of the Indigenous people that make true Cowichan Sweaters (also the reason we don’t teach a class on Cowichan sweaters). If you are interested in the history of the Cowichan Sweater, I highly recommend the Book “Working with Wool” we have a few copies in the shop! So I began by using the Briggs and Little Sweater sizing and gauge. (These pamphlets can be downloaded for free at their site, or pick up a copy at the shop). Next I found the bottom and top colourwork pattern in a vintage pattern – these are often hard to come by, but if you are an expert 2nd hand shopper keep your eyes open for the patterns. (We have a few at the shop that we will share!). Then I created a chart with my logo, I know that there are fancy apps that will do it for you, but I just printed the logo onto some graph paper…and it worked out! I absolutely LOVE this vest, it has been so perfect for our weather, it keeps me warm, but not too warm, it works as an outer or inner layer! I love everything about it! We have a great selection of the Briggs and Little Country Roving, stop by the shop and take a look! Any consideration to embroidering store name above in the white space? I’d certainly wear this (free advertising for the store). Today three people I don’t know asked me where to get yarn (saw me passing time in the mall).